What Happens To Additional Funds In My CPF Ordinary Account If I Continue Working After The Age Of 55? 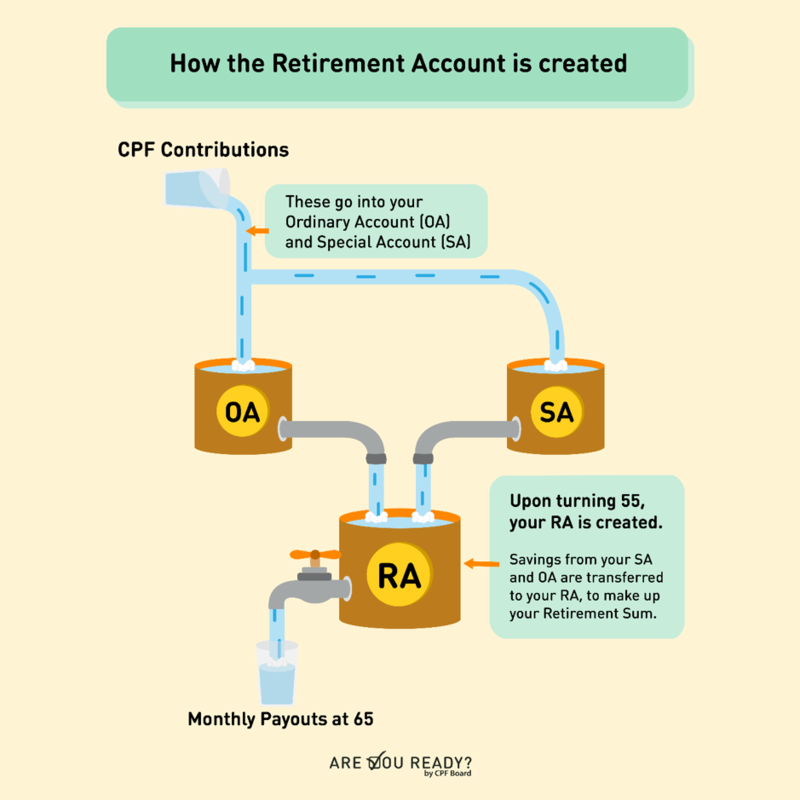 At the age of 55, monies in my CPF Ordinary Account (OA) and Special Account (SA) will be transferred to my newly-created Retirement Account (RA). What happens if I continue to work and make regular contributions to my CPF OA and SA? Can my additional contributions be transferred to my RA to increase my CPF LIFE payout when I reach 65 and beyond? Will I be able to withdraw the additional funds at the age of 65? When you continue to work at the age of 55 and beyond, it is still mandatory for your employer and yourself to make CPF contributions, though at reduced proportions compared to your early years. Contributed monies in your CPF OA and SA (and MediSave) will continue to earn risk-free interest. You can keep your OA funds if you wish to use it to service your monthly housing repayments, or withdraw the funds if you need it. Alternatively, you can also make transfers from your OA/SA to your RA under the Retirement Sum Topping-Up Scheme up to the current Enhanced Retirement Sum (ERS), This allows you receive higher CPF LIFE monthly payouts for life. To make transfers, you can visit login with SingPass at the CPF website and select “My Requests” and “Building Up My/My Recipient’s CPF Savings”. Is It True That In The Event Of Death, Our Beneficiaries Don’t Receive Interest Earned By Our CPF Retirement Account? I have a question regarding interest earned by my CPF monies after joining CPF LIFE. Is it true that our beneficiaries will NOT receive the interests accumulated and that this interest goes back to the common fund for other CPF LIFE annuitants? Recently, there has been some confusion online on this issue, with some Singaporeans feeling shortchanged. At age 65 onwards, our RA monies will be used to “buy” into the CPF LIFE annuity scheme as premium payment. This money is pooled in the Lifelong Income Fund, which is used to provide payouts to all CPF LIFE members. At no point in time did the CPF Board give any indication that interest earned by monies in your CPF Retirement Account goes into your account and can be left to your beneficiaries. In fact, this is one of the differences between the Retirement Sum Scheme and CPF LIFE. In the old Retirement Sum Scheme, interest is paid into our Retirement Account Balances, and this amount is gradually drawn down during our retirement until nothing is left, and payouts stop. Read Also: CPF LIFE VS Retirement Sum Scheme: What’s The Difference? The key thing to remember, is that the original promise of CPF LIFE is still upheld. If we pass on early, our beneficiaries will be receiving at least the amount we put into CPF LIFE, minus the payouts we already received. If we outlive our initial Retirement Account balances, we will still be assured of monthly payouts for as long as we live. And it is the pooled interest earned from the Lifelong Income Fund is what makes this valuable feature possible. How To Claim CPF Monies Of Deceased Next-Of-Kin And How Long For The Money To Be Disbursed To Beneficiaries? In the event a CPF member passes on, what is the process for the next-of-kin for claiming their deceased loved ones’ CPF monies? How long will it take to process the payout, and in what form will the payout take? Is it a transfer to the next-of-kin’s CPF account? The first step would be to check with the CPF Board whether the deceased has made a CPF Nomination. If they made a valid CPF nomination: the CPF Board will make the payout according to the instruction and type of nomination. For Cash nomination (the default type), payment will be made via cheque or GIRO, while nominee(s) under the Enhanced Nomination Scheme (ENS) will receive the CPF savings due to them in their CPF accounts. There is also a Special Needs Savings Scheme (SNSS) Nomination which provides monthly disbursements. If they did not make a valid CPF nomination: The CPF Board will send the CPF money to the Public Trustee’s Office. Surviving family members will then need to make an application to claim the money. There is a minimum fee of $15, which will be taken from the CPF money and cannot be waived. According to the Public Trustee’s Office website, they will distribute the money within 4 weeks from the date of receipt of the full set of documentation from beneficiaries. Read Also: What Happens To Your CPF Savings When You Pass On? What Are The Schemes Available To Support Retirees Who Are Asset Rich But Cash Poor In Singapore? Your article on grants and subsidies for lower and middle income families is indeed very informative. I am one of those who are asset rich but cash poor and my hard earned savings is depleting thanks to the high cost of living in Singapore. I am 70 and not working but pay property taxes, GST, etc. Are there any government grants and subsidies for those without an income, such as retirees? The challenge faced by asset rich, cash poor Singaporeans is a serious and well-known one, and the government has been making efforts to adjust its policies to support this “sandwiched” group of Singaporeans. For example, in the area of healthcare, it was announced that CHAS will expanded to cover all Singaporeans with chronic conditions, regardless of income. This is one of the measures to help alleviate the cost of healthcare. Other forms of ongoing support that retirees living in private property can receive include GST Vouchers, as well as Pioneer and Merdeka generation packages. If you are facing difficulties with the cost of living, you can consider applying to ComCare, which provides cash assistance, and discretionary grants for daily essentials and medical bills. At the community level, you can also look for your respective Community Development Council which administers localised assistance schemes. With closer integration among the social service sector, regardless of which social service organisation you approach for help, you’ll be referred to the right schemes and organisations that can best serve your needs. What’s The Difference Between Stocks Held In A CDP Account Versus A Custodian Account? When choosing a brokerage account, I notice there are two different ways stocks can be held – either in a CDP or Custodian account, each with different charges. What is the difference and is the extra cost of holding stocks in my own CDP account worth it? When choosing a brokerage account, you will see that some accounts are designated as custodian accounts, sometimes referred to as pre-funded accounts. Commissions for these types of accounts are cheaper than “regular” brokerage accounts, because your brokerage firm is helping hold your stocks. For brokerage accounts for CDP-held stocks, your broker is the facilitator of the transaction, and passes on the charges that CDP levies. For stocks held in your CDP account, you legally own a share of the company and would be invited to attend and vote during AGMs, and receive other forms of shareholder communication. Companies you invest in will also notify you directly about corporate actions, which include rights issue and dividend re-investment plans. For custodian accounts, your brokerage firm will be the ones notifying you regarding any corporate actions. When holding investments in your CDP account, you can use brokerage firms interchangeably to execute your trades. You can buy a stock using Brokerage A and then sell using Brokerage B. If you trade frequently, you can take advantage of the lower fees of custodian accounts. If you plan to hold investments for a long time and prefer a stronger legal basis and exercise your rights as a shareholder, then you wouldn’t mind paying higher charges for your investments to be held in your CDP account. Do I Earn Interest On My CPF Monies Once I Start Receiving CPF LIFE Payouts? When I turn 65 and start to draw monthly payouts from CPF LIFE, does my remaining monies in my CPF Retirement Account still generate interest? First of all, we need to understand what happens to our monies when we enroll into the CPF LIFE scheme at the age of 65 (assuming we don’t voluntarily defer our payouts). If you choose the CPF LIFE Standard or Escalating plan, all of the monies in your CPF Retirement Account (RA) is withdrawn and paid as premiums to purchase your CPF LIFE annuity plan. Your RA would now be empty. It is important to note that even after your CPF LIFE policy has commenced, you are still eligible to earn interest on all your CPF accounts, namely, the Ordinary Account, Special Account, MediSave Account and Retirement Account. However, the lump sum that you paid to purchase your CPF LIFE annuity plan is now pooled together with other Singaporeans in the CPF Lifelong Income Fund, and any interest on those monies is used for making sustainable payouts for years to come. Can I Apply To Buy A HDB Flat If I Worked For Less Than A Year? I have a partner and we just started work for less than a year. We plan to apply for a HDB BTO and would like to ask when is the earliest possible time we can do so? Even though you can ballot with your partner for any of the BTO sales launches, you should only do so after carefully assessing your own financial situation and determining the size and location of flat you can actually afford to pay by the time the BTO is ready. After you’re successful in balloting for a queue number and invited to select a flat, you’ll need a HDB Loan Eligibility Letter (if you’re taking a HDB loan) or Letter of Offer from the bank (if you’re taking a bank loan), as well as have enough cash and/or CPF to make your downpayment. Banks have their own income and work history requirements, so do check with them if you qualify. If you’re interested in exploring a bank loan, you can use our landing page to get a quote on how much you’re likely to receive. If you’re taking a HDB loan, the HDB Loan Eligibility Letter basically says that you meet the basic requirements for a HDB loan. Given your short work history, you are likely to qualify for only a small loan amount that may not cover the cost of the flat, after deducting grants and your downpayment. That is fine, since the Loan Eligibility Letter is valid for 6 months from the date of issue anyway, so you will need to apply for another one before your key collection. You just need to ensure that by that time, you qualify for a higher loan amount, or have enough CPF and/or cash to pay for any shortfall. You might be interested to know that from the May 2018 BTO sales launch onwards, eligible couples applying for their first flat can defer income assessment for their HDB housing loan until their key collection. To qualify for this deferred income assessment, couples need to be either 1) full-time students; 2) National Servicement; 3) Completed their studies or National Service in the past 12-months before the flat application. Can I Extend My Loan Tenure If I Perform A Refinancing Of My Home Loan? If I am servicing a bank loan for my HDB flat, can I extend the loan tenure if I refinance the loan? The maximum loan tenure cannot exceed 30 years for HDB flats and 35 years for private properties, but the actual tenure that you’re offered may be shorter depending on your age and the years left on your property. If the tenure of your original home loan was reduced by your age or lease of your property, then refinancing would not help you extend your tenure. In addition, banks tend to look at when you purchased your property, and deduct that period from the tenure they are willing to offer you. The only time when refinancing can help you get a longer tenure is if you took a short tenure loan previously, and would now like to stretch it to the maximum period you’re entitled to. What Is The Eligibility Criteria For Renting A Flat From HDB? How do I apply for a HDB rental flat? Is there any income ceiling or minimum age? In general there are two schemes that allow you to rent a flat from HDB at subsidised rates: Public Rental Scheme and Parenthood Provisional Housing Scheme. Parenthood Provisional Housing Scheme on the other hand, is meant to provide temporary housing for families as they await completion of their HDB flats. 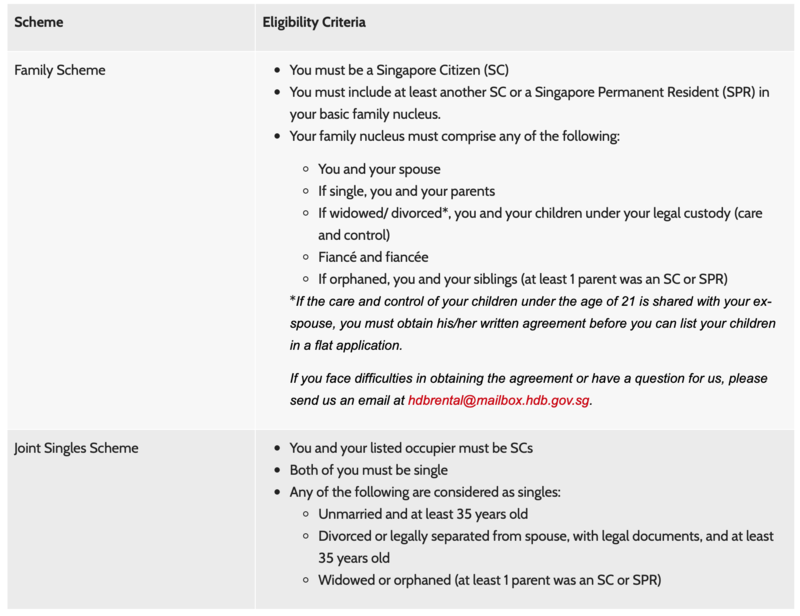 You can read in detail about the eligibility criteria on the HDB website. If you do not qualify for either of these schemes, the alternative would be to rent from the open market. Can Singapore Permanent Residents Apply For A HDB BTO Flat? For all HDB BTO flats, the main applicant must be a Singapore Citizen. If the co-owner is a Singapore Permanent Resident (PR), then they will be able to apply for BTO flats of all sizes under one of the schemes they qualify under – such as the Public Scheme, Fiance/Fiancee Scheme. If the co-owner is not a Citizen nor a Singapore PR, then they can still apply for a 2-room BTO flat in a non-mature estate. However, the non-Citizen must be holding a valid Visit pass or Work pass at the time of application. For more information about the other eligibility criteria (such as income ceiling, age and property ownership), you can refer to this article on DollarsAndSense. JustAsk is an initiative by DollarsAndSense for you to get your burning questions answered.